Weiβ Schwarz Cards of the Day: 8th of April | TCG, shiyo? A new week brings a continuation of the Love Live! and Vividred Operations previews, and it still looks like there is no sign of anything but Yellow in the Love Live! deck. [ACT] [(1)] During that turn, this card gains Soul +1. 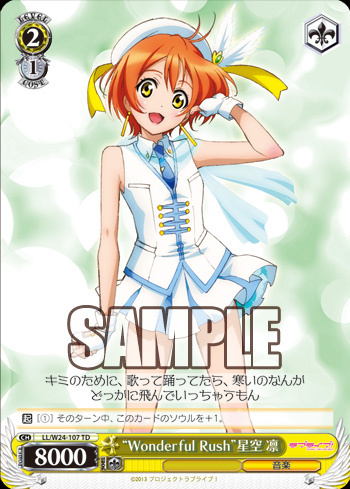 Rin has a simple effect that’s best saved until the end of the game, since it could win you the game. However you have to use her effect sensibly, otherwise it could all backfire on you and be a massive waste of Stock. If you know your opponent has no Climaxes left, you can pump up Rin enough to be able to win the game in one blow, or alternatively just cause lots of damage. Otherwise you could use it as a way to cause a single damage via a Side Attack. Outside of these scenarios it will be risky to use Rin’s effect, because you have no guarantee it will really achieve anything. [ACT] [Rest 1 of your «鍵 Key» characters.] During that turn, this card gains Power +1000. Aoi’s back again, and this time with quite a useful Level 0 card. Thanks to Encore she’s hard to get rid of, and can help you maintain field presence. Her second effect could also make her a very powerful Level 0, meaning that you can pay the opponent back for attacking her on the previous turn. If you have 2 Back Stage cards she can easily reach 4000, plus supports, meaning she can defeat most Level 0 cards. If you don’t have a full Back Stage you can at least get her to 3000 though, enough to clash with vanillas. 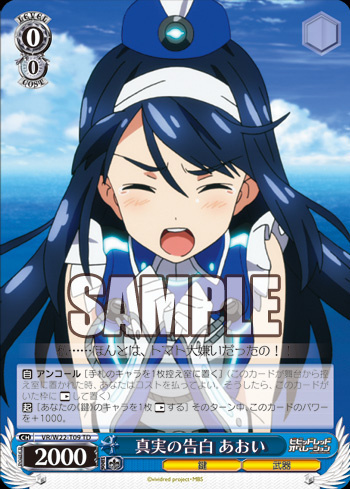 Without any other cards to help her, she might still be useful for dealing with Reverser cards.